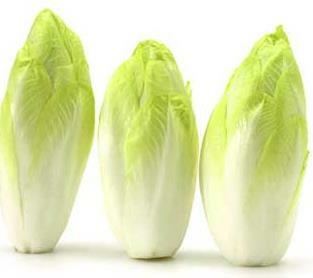 There are four general types of lettuce recognized as subspecies. All are extremely sensitive to high temperatures. Lettuce will germinate at soil temperatures of 32°F, but the optimum and maximum soil temperature is 75°F. When seeded at a soil temperature of 80°F, the seed will not germinate but rather remain dormant until cooler temperatures prevail. Lettuce that is already established and subjected to high temperatures will bolt and form a seed head. Crisphead types will suffer from internal tip burn of the leaves. Crisphead or iceberg is commonly found in produce markets. The leaves are thin and crisp and frequently have curled or serrated edges. Today’s consumer is looking for a firm, durable head. Butterhead or bibb lettuce is a head type with loosely folded leaves. The outer leaves are green while the inner leaves are cream or yellow. Butterhead type lettuce requires careful handling as it bruises and tears easily. For this reason, it is best suited to local market sales. Cos or romaine is an upright plant with the outer leaves smooth and green and the inner leaves whitish green. Some think the leaves are more crisp than other heading types. Leaf lettuce, loose leaf or loose head are all names applied to the fourth general type. 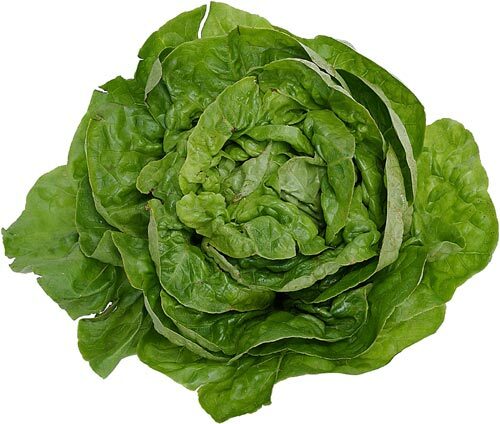 Lettuce of this type does not form a head and the leaves may be serrated, deeply lobed or crinkled. Leaf lettuce color varies from light green to red, adding attractive color to the salad or dinner plate. Lettuce grows best at cool temperatures, making spring and fall the major production seasons in New England. In northern parts of the area, lettuce can be grown through the middle of the summer, but escarole or endive can make a satisfactory substitute during warm weather. Because lettuce is generally harvested on a once-over basis, uniformity at harvest is essential. Growers should purchase the best quality seed available to help ensure the uniformity of the crop. Precision seeding, with modern planters, and coated seed can enhance uniformity. Irrigation immediately after seeding also promotes uniform emergence. Transplants are often used for lettuce production. They are started in the greenhouse in February or March, and hardened transplants are set out in April. Hardening of lettuce transplants is accomplished by withholding water and gradually reducing temperatures for 10 days before the planned transplant date. Harvest will be in about six weeks. Some growers are finding that the use of floating row covers over the bed in combination with early transplanting will provide an earlier lettuce crop for a specialty market. Transplants can be used all season, from mid-April to August 1. Varieties that do well as transplants even in mid-summer and are very slow to bolt include Ermosa (Boston), Slobolt (green leaf), New Red Fire (red leaf), and Green Forest (Romaine). Starting transplants in the greenhouse always provides better germination under warmer conditions than in the field.